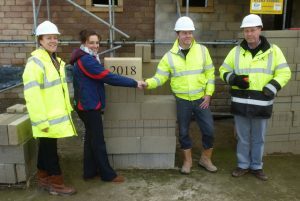 On Friday 19th January the “2018” date stone was formally laid above the front door of the new sports pavilion at Belper Meadows. The previous wooden pavilion had stood on this site for over 100 years and the new one is sure to be around for the future sporting generations of Belper and its surrounding areas. Spectators were invited to view the work in progress and take in the excellent views of all four sporting areas (tennis, bowls, hockey and cricket) from the balcony. It must be remembered that all this would not have been possible if not for the tireless work of Belper Meadows Tennis Club’s previous chairman, John Morris, who sadly died earlier this month.